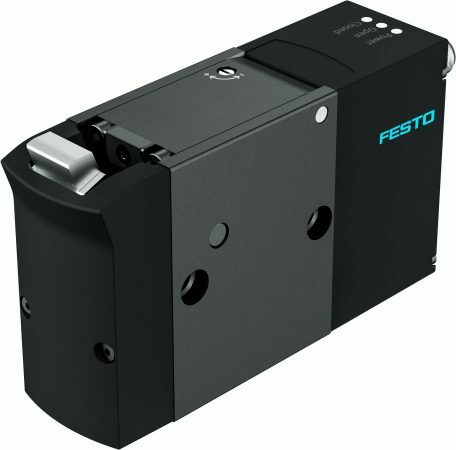 Festo’s new EFSD electric stopper provides exceptional stop-and-release functionality in the movement of product from station to station in assembly and transfer systems. With benefits such as a lower installation cost, faster commissioning and operational energy savings, it is the ideal choice in stop-and-release wherever an electric actuator is preferred to a pneumatic option. EFSD cylinders are suitable for a wide range of applications, from small parts assembly to packaging, warehousing and logistics. Opting for a purely electric automation solution reduces installation effort compared with pneumatic solutions; there are no valves, tubing and air preparation required. This can be particularly beneficial where there is no existing air system available or it’s problematic to introduce one. Installing EFSD is so simple; It can be mounted directly on the profile of the transfer system with just two screws. Unlike competitor products, the EFSD cylinder features internal logic processing via digital I/O, so there is no need for an external motor controller. This further simplifies installation and makes it easy to commission. Integrated sensors provide status feedback (i.e. whether the stop plate is extended or retracted). An adjustable damping module makes EFSD both precise and reliable during operation. The unit can provide flexible damping to correspond to the mass of the transferred item, so one size EFSD can cope with a variety of moving masses. This adjustable damper feature requires less maintenance than using shock absorbers. EFSD comes in sizes 20, 50 and 100, enabling users to match the mass range depending on the speed of the conveyor up to a maximum of 100 kg. Its 24V DC motor has a maximum power consumption of only 2A. In addition, energy can be supplied via a PLC connection, eliminating the need for a separate connector.